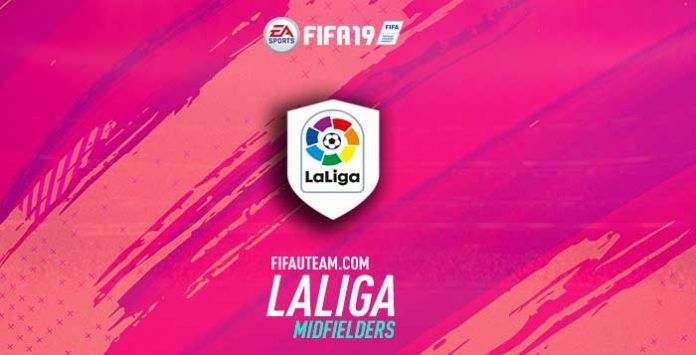 Who are the best FIFA 19 LaLiga midfielders? Let’s find out good defensive, centre and attacking midfielders, as well as right and left wingers, to your team! Casemiro and Busquets are by far the most popular defensive midfielder. Casemiro is the one who defends better. 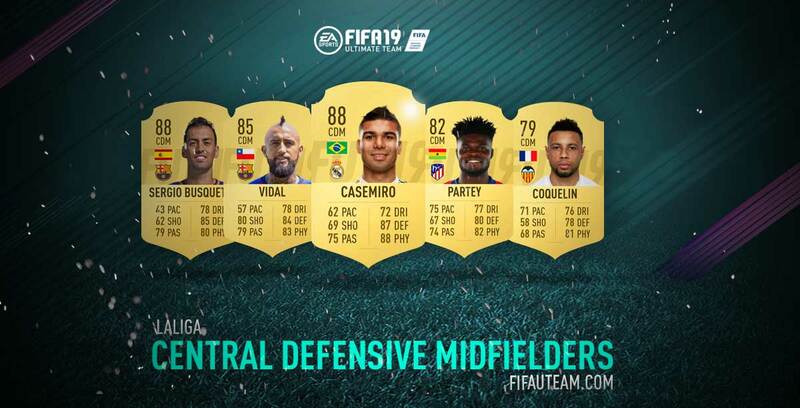 Oce again, Casemiro is the strongest one. In our opinion, Casemiro is the right choice for this position. He is the CDM who gives more security to the back line but he is also a good offensive player. He could be faster but compared with the other CDMs, he is OK.
Thomas Teye Partey was a pleasant surprise and definitely great value for money. He doesn’t have the stats of Arturo Vidal, especially shooting, but if you want someone to play anywhere in the field, you should look to him, since he has a high/high work rate and superb stamina. Because of his low speed, Busquets was relegated to the fourth position. It’s in midfield that there’s more quality in the LaLiga. Some of the world’s best footballers play there. It’s the case of Luka Modrić and Toni Kroos. Even though Kroos and Parejo have a great passing stat, Modrić is the one who does it better in the whole LaLiga. Once again, Luka Modrić is the centre midfielder with best dribbling stat in the LaLiga. 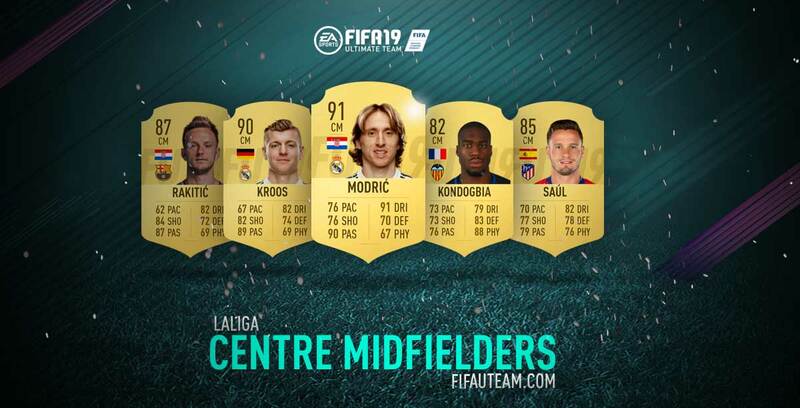 The best player to use in this position is obviously Luka Modric, FIFA Player of the Year winner. He isn’t cheap but he has a lot to give to your team. Kroos is the best alternative to him. He isn’t so fast but has a better shooting, including a 5-stars weak foot. 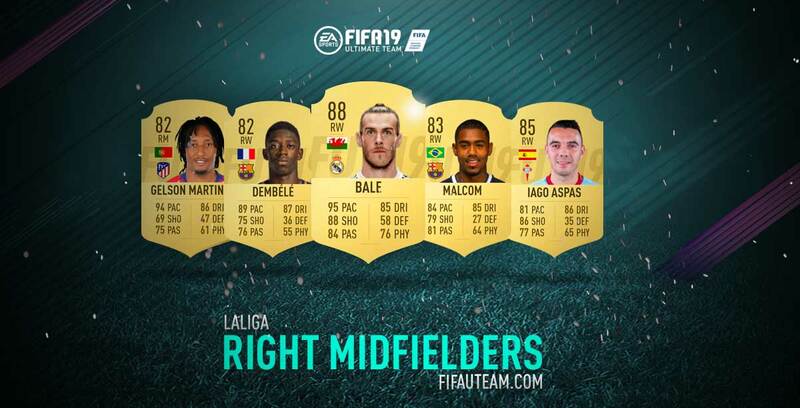 If your budget isn’t good enough to buy them, you can try to replace them by Rakitic. However, we strongly suggest you to try Kondogbia. He is able to help your defense and recover the ball, which means that he can be very useful when playing side by side with someone more creative. Isco is the only top-quality CAM playing on this league. No one has better passing stats than Banega. 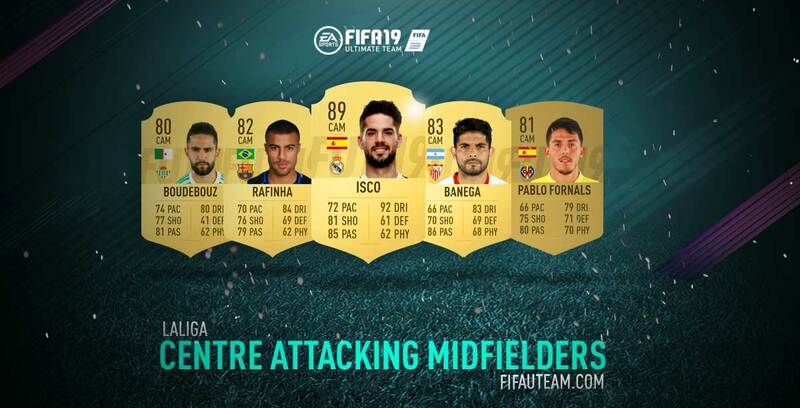 Once again, Isco is clearly the best one on dribbling. Isco is easily the best CAM playing on this league. No one can be compared to him. However, he’s not cheap and you may need an alternative. The problem is to decide between Rafinha and Éver Banega. The first one is faster, has better shooting and more interesting work rates. The other is stronger and finds a chance more times. Gareth Bale is one of the most rated players in this league. Bale and Gelson Martins are extremely fast. There are a lot of players gifted in dribbling, being Ousmane Dembélé the best. Surprisingly (or not! ), Pedro León is the right midfielder with the best passing stat on this league. You know Gareth Bale. He’s a beast. With him on your team you will have a lot of quality time playing FIFA. However, he’s very expensive and you probably will need to find a few alternatives to him. Dembélé is a great choice if you need someone focused on the attack, but Malcolm is also a good player. There is also Gelson, who is extremely fast and has five-stars skills. He is the right man to run on the flank. We know that Aspas has a lot of fans but we believe his stats are more suitable for a striker and we are analyzing wingers. If you usually love to shoot with them, then maybe you should use him. Coutinho, Asensio and Koke are the three most popular players in this position. LaLiga left wingers are extremely fast. There are four players playing in this position with pace equal or higher than 90. Coutinho is the LaLiga winger with the best dribbling stats. Koke and Coutinho are clearly the best fitted passers between the remaining left wingers. 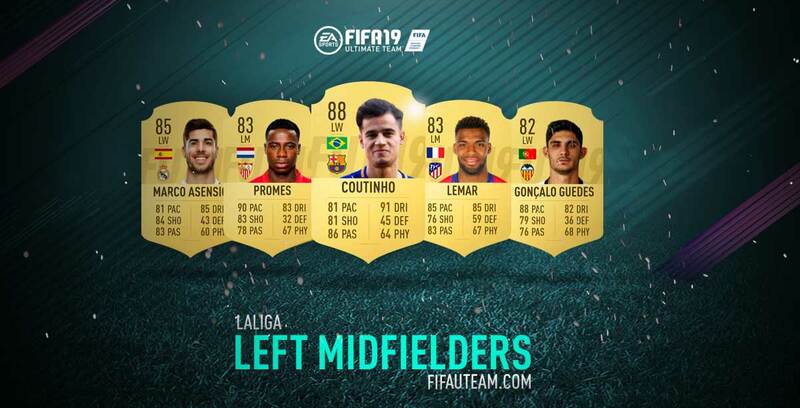 As expected, Coutinho is the best left winger on this league. However, don’t think he can’t be replaced. Promes was an amazing addition this year. He has 5/4 stars, just like Coutinho, is much faster and everyone want to try him. There are no much difference between Lemar and Asensio. We believe that the first one has stats more suitable for his position, and for that reason we put him on the third place of our list. If money is a problem, you can play with Gonçalo Guedes. He’s not as good as the first four but, for low budget squads, he will make the difference. Koke and Vinicius Júnior are very popular players but were relegated for lower positions because of their low pace and passing stats, the two most important attributes for this position. Hello rodrigo. I start with 41212 wide and change to narrow in game.So my LM changes to CM. Who do i go for Marcelo or coutinho? I hv a laliga squad. Would marcelo be ok? Yes, you may try him. Heyyy i wanted to use bale as a striker with marksmen but think griezmann has same stats for 100k less . So who do i go for? It isn’t exactly the same thing, but I would go for Griezmann. Hi Rodrigo, I play 4-2-3-1 with Isco as CAM and Vidal and Casemiro as CDM. should I replace Vidal with Busquets, a specialist CDM, or Kroos? I have two basic questions that can help me (or not) with my Laliga team. 1) If my team has 100 chemistry can I swap one player from Laliga to player from another. Like I have 2CDMs – Kondogbia and Casemiro but don’t like the second because of his pace. I want to change him to Fernandinho (still 100 chemistry but has only one amber link with Lemar and rest are red). Does the game engine count links between all players or only use chemistry value in game mechanism? 2) Which minuses will I have to put Aspas as CAM? His position market as red but for me he plays better than Rafinha/Rakitic that I tried before. I thought about Isco too but he looks not so fast and I prefer fast/quick attacks. I can’t find any RM->CM or RW->ST->CAM transformation cards. 1) It only counts individual and team’s chemistry. The colour of the links doesn’t matter – it is only to help people to understand where they can improve if they still don’t have 11×10 and 100. 2) Yes, there are no RM-CM cards. However, as a RM he won’t be as much penalized as if he would be a RW. You can understand better how mch chemistry he will lost here. Hello Rodrigo and thank you once again for your great guide! I play a 4-2-3-1(2) formation and I cannot afford Isco, Modric or Kroos but I have managed to acquire Rakitic and Saul. I’m wondering if you think it would be worth playing Rakitic or Saul at CAM rather than Banega or Rafinha? It seems their quality is higher. What do you think? Alternately if you think an affordable CF would be a better fit, I am open to that as well. Thank you. Yes, I believe you should try them instead of Banega or Rafinha.